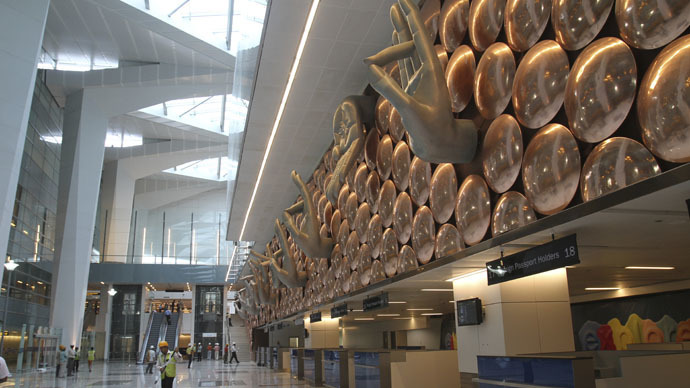 A radioactive leak has been detected at India’s capital IGI Airport, Press Trust of India reported. Radioactive material was spotted onboard a flight from Turkey. An anti-sabotage team from India’s National Disaster Response Force (NDRF) has arrived at the scene. "We are monitoring the whole situation. A radioactive substance came from Istanbul for Fortis Hospital whose authorities have been called," an NDRF representative said as cited by the Times of India. The contaminated aircraft of Turkish Airlines has been parked in the cargo terminal of Delhi's Indira Gandhi International (IGI) airport. The area has been cordoned off. The source of radioactivity turned out to be a container with medical equipment. India’s Union Minister of Home Affairs Rajnath Singh has confirmed that the leak has been plugged.